As you can tell by my previous Metal Men post, I've been going through a set of old Amazing Heroes magazines from the 1980s. This was one of our main sources of comics news, and they had some terrific covers. 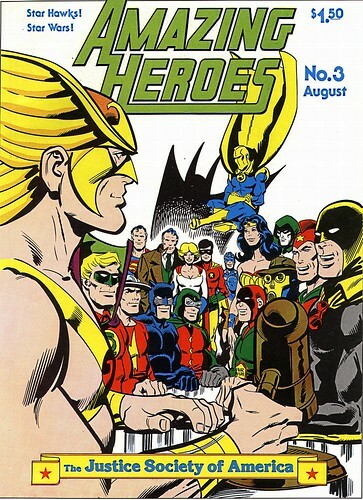 Amazing Heroes #3 featured this Justice Society of America cover featuring both old and new generation. 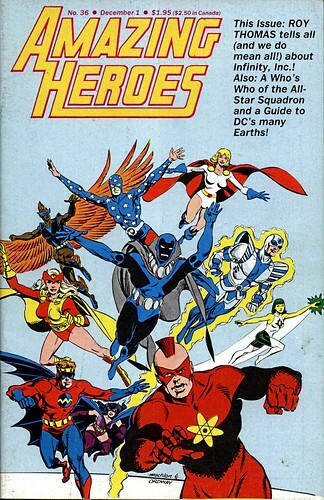 Joe Staton, who drew the JSA in the revival of All-Star Comics, did this cover. The classic Golden Age characters are in the foreground, but take note of the ones featured in the back. The Earth-Two versions of Superman, Bruce Wayne, Power Girl, Robin, and Star Spangled Kid. A couple of years later, the new generation--Infinity Inc--came along and booted the JSA out of the spotlight. This cover by Mike Machlan and Jerry Ordway introduced us to Nuklon, Brain Wave Jr, Fury, Northwind, Obsidian, Silver Scarab, and Jade. Along with familiar characters: Power Girl, Huntress, and Star Spangled Kid. The interior content featured a nice interview with Roy Thomas and loads of information on the Earth-Two mythology. Nuff said.